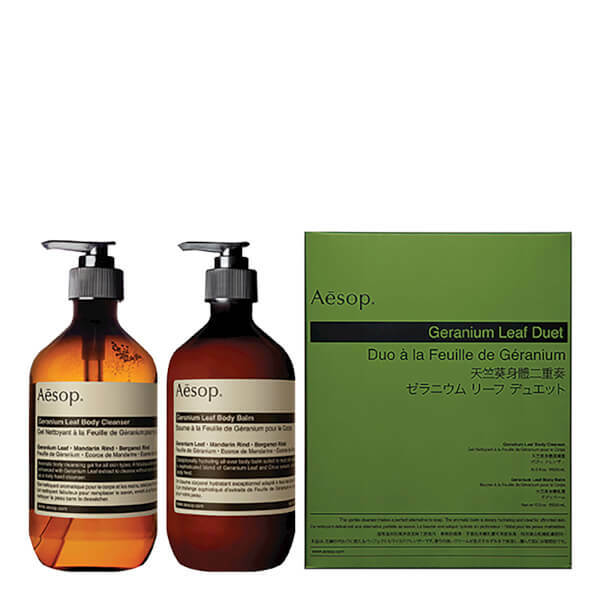 The Aesop Geranium Leaf Body Cleanser and Balm Duet combines a duo of complementary treatments to purify and pamper skin. 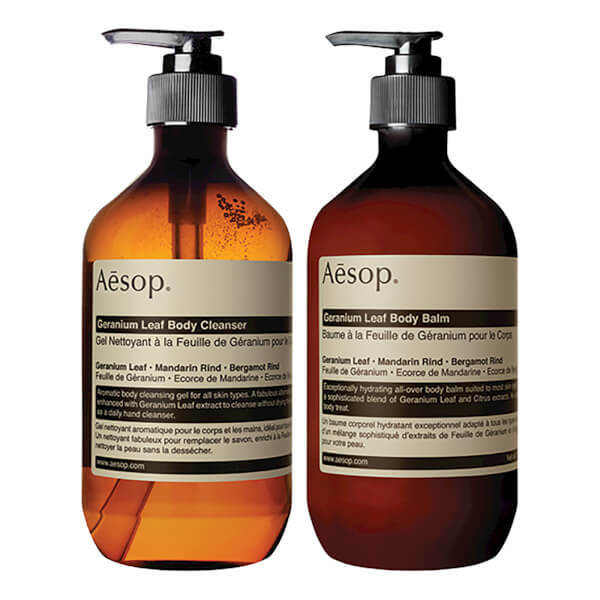 Both featuring an uplifting citrus aroma, the body wash and balm are enriched with powerful natural extracts to leave skin feeling intensely hydrated, refreshed and smooth. The clear gel formula effectively eliminates dirt, impurities and excess oil to leave skin feeling cleansed and revitalized. Enriched with Geranium Leaf, Mandarin and Bergamot Rind, it features a re-energizing aroma that perfectly encapsulates freshness. Dispense Body Cleanser directly into your hands or sea sponge. 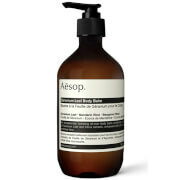 Lather and massage over soaked skin, then rinse thoroughly. 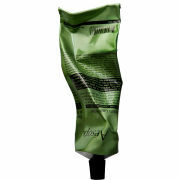 Follow with Body Balm; massage desired amount from neck to toe, concentrating on dry areas such as elbows and feet. 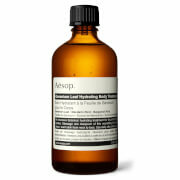 Body Cleanser: Water (Aqua), Sodium Laureth Sulfate, Coco-Betaine, Cocamide DEA, Sea Salt (Maris sal), Citrus Aurantium Bergamia (Bergamot) Fruit Oil, Citrus Nobilis (Mandarin Orange) Peel Oil, Pelargonium Graveolens Extract, Citric Acid, Methylchloroisothiazolinone, Methylisothiazolinone, d-Limonene, Citronellol, Geraniol, Linalool. Body Balm: Water (Aqua), Glycerin, Prunus Amygdalus Dulcis (Sweet Almond) Oil, Stearic Acid, Cetearyl Alcohol, Ceteareth-20, Cocos Nucifera (Coconut ) Oil, Macadamia Ternifolia Seed Oil, Glyceryl Stearate, Citrus Aurantium Bergamia (Bergamot) Fruit Oil, Citrus Nobilis (Mandarin Orange) Peel Oil, Pelargonium Graveolens Extract, Tocopherol, Aloe Barbadensis Leaf Juice, Butyrospermum Parkii (Shea Butter), Phenoxyethanol, Theobroma Cacao (Cocoa) Seed Butter, Triticum Vulgare (Wheat) Germ Oil, Glycine Soja (Soybean) Oil, Disodium EDTA, Benzalkonium Chloride, Daucus Carota Sativa (Carrot ) Root Extract, Beta-Carotene, d-Limonene, Citronellol, Geraniol, Linalool. I have been using these two products for a week now and my skin is the softest it has ever been this winter! I'm addicted!